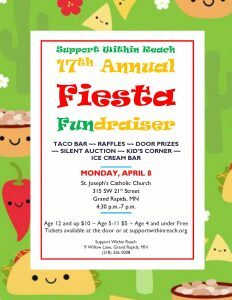 17th Annual Fiesta Fundraiser is scheduled for April 8, 2019! Artists and artisans: contribute and we’ll split the winning bid 50/50 with you! Our annual Fiesta Fundraiser, held in conjunction with Churches Against Sexual Abuse, is at St. Joseph’s Church in Grand Rapids. Silent auction, taco buffet, ice cream and kids’ corner. Tickets are $10 for adults, $5 for children 5-11, and kids 4 and under eat for free. Tickets make a great gift for loved ones to enjoy a fantastic community supper! All proceeds from this event go directly to serving those who have felt the impact of sexual violence. Thank you so much! Stop into our Itasca office at 9 Willow Lane (new location), Grand Rapids Monday-Thursday 8 a.m. to 5 p.m., Friday 8 a.m. to 12 p.m.